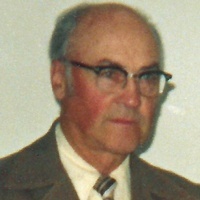 Gene White, 93, from Jamestown, ND passed away on Tuesday morning Jan 15, 2019 at the Rock of Ages Care Home. Eugene Ivan White, aka Gene, was born Feb 10, 1925 at Bismarck, ND, the son of Lester and Aileen (Magee) White. Gene served in the Korean War from Oct 1, 1950 to Sept 15, 1952. Gene was a long standing member of the American Legion. Gene farmed in Buckeye Township. He married Caroline Reiner-Krueger on June 1, 1963 in the Tappen Lutheran Church. With the marriage, Gene inherited the pre-made family of four Krueger children. Gene and Carol had two sons – James and Jason. Gene and Carol lived and farmed in the Tappen area. They went on a conservation tour of Europe, travelling for weeks through England, Germany, France, Holland and Russia. Gene is survived by his son James (Brenda) White, Sr., Garrison TX; his grandson James (Ashley) White, Jr., San Diego naval base, and two great-grandchildren – Evie White and James Allen White III. Gene is survived by his sister Floraine White-Dougherty, Mandan; his brother Bill (Helen) White, Bismarck; his sister Cora (Marvin) Stenberg, Fargo; his sister-in-law Loretta Trautmann-White, Mandan. Gene is survived by his extended family: Donald (Garnet) Krueger, Jamestown; Jackie (Jon) Henderson, Bismarck; JoAnn Krueger, Fargo; LeRoy (Kelly) Krueger, Steele. Gene was preceded in death by his parents, his wife Carol, his brothers Dale and Glen White, his brother-in-law Lyle Dougherty, and his son Jason.